This is a continuation of my series on how the elite swim various races. In previous posts, I’ve analyzed all of the 200 races. I used the term ‘Offset’ to represent the difference between a swimmer’s split, and their PB for that distance. Ex. If a swimmer does a 59.0 as one of their 100 splits, and their 100 PB is 55.0, then their Offset for that split is 4.0. You’ll soon see why this concept is useful. When analyzing the 200 Freestyle race (see here), I came across an interesting trend involving strategies. Based on the swimmer’s apparent tendency towards sprint or distance (or mixture of the two), a clear race profile emerges. The following chart shows actual data from the 200 Freestyle analysis. I added Katie Ledecky’s race profile, as she represents an extreme version of an elite distance-oriented swimmer. With the 400 being twice as long, we can expect to see most swimmers with distance profiles. This first two chart shows the average splits for the top, middle and bottom groups according to their 400 times. We can immediately see that each group average strongly resembles the distance race profile seen above. But the splits themselves are not very useful for the average swimmers. This next chart looks at the same data, but now shows the average offsets for each group. Now this is more interesting. All three groups are almost identical in terms of how they swam their races relative to their 100 PBs. Clearly there is a strong trend in elite 400 race strategy. The first 100 offset is 2.5 – 3.5 seconds, followed by 2nd and 3rd 100 offsets at 6 seconds, and a final 100 offset at 5-6 seconds. Next, I wanted to find out which part of the race separated the fastest elite swimmers from the rest. For each 100 split I ordered the swimmers from fastest to slowest split time, and then determined how closely this order matched the order for the overall race. The smaller the number, the closer the match, and therefore the more important that particular 100. Interestingly, the final 100 was the least important, in that the ordering of swimmers according to the final 100 split time was least similar to the ordering of the race. I think this just means that the ordering of the 400 was pretty much set by then. From this we can see that the closest match is the first 100, followed closely by the third 100. This tells us that the race starts hard, with the fastest swimmers getting to the front right away, and then another big push in the 3rd 100. Finally, we’ll look at the race strategies of the top 4 swimmers to see if tey did something different from the rest. We notice right away that the top 3 swimmers deviate significantly from the typical race profile seen above. 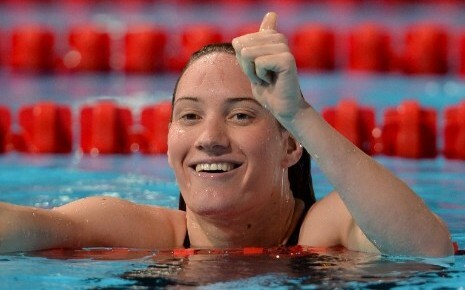 The top 2 swimmers, Camille Muffat and Allison Schmitt, have much higher offsets throughout the race. This is most likely because of their very fast 100 PBs, allowing them to swim the 400 with these high offsets. They use a distance profile with a faster 3rd 100. At the other extreme, Rebecca Adlington shows a classic distance profile with very low offsets: the lowest out of all 24 swimmers. For the most part, the 400 Freestyle for women is largely raced in a similar distance-profile fashion. The first 100 offset is roughly 2.5 – 3.5 seconds, followed by 2nd and 3rd 100 offsets at 6 seconds, and a final 100 offset at 5-6 seconds. The 1st 100 seems to be the most important part of the race, in that the top overall finishers also generally had the fastest 1st 100 splits. And finally, it’s not until we get to the top 3 swimmers that we get differences from the above race strategy. The gold and silver medalists both utilized their very good 100 PBs to swim the race with offsets among the highest of the 24 swimmers. The bronze medallist did the opposite, with the absolute lowest offsets of all 24 swimmers. Next Post Is Russia the New East Germany?